20 minute meal! 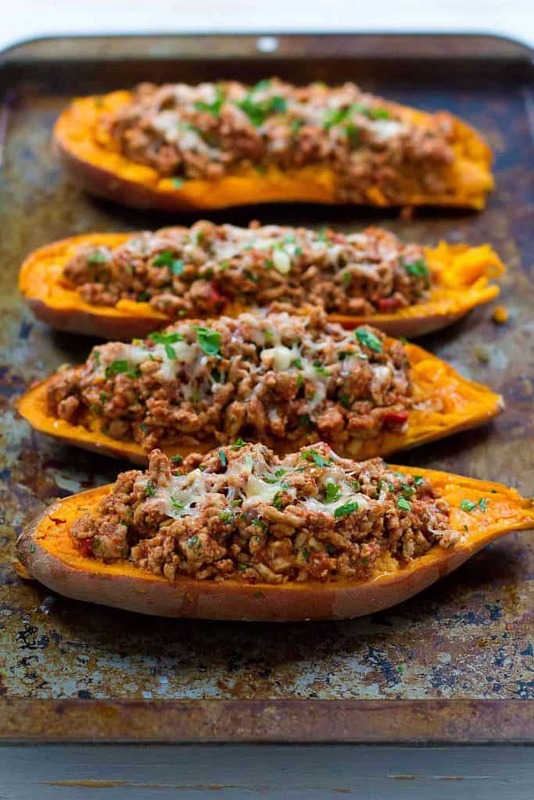 These Turkey Taco Stuffed Sweet Potatoes are a fantastic option when you need a quick dinner recipe. 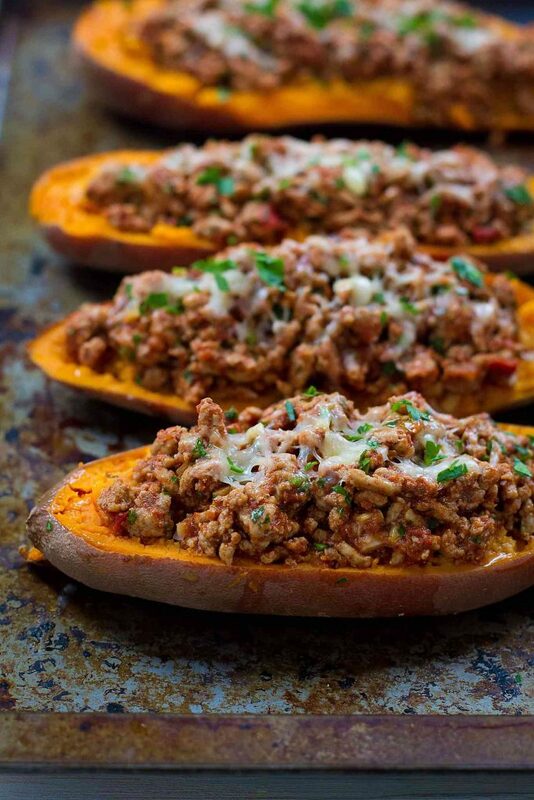 Hopefully these turkey taco stuffed sweet potatoes will get such rave reviews. They certainly did at my house! While it can be very convenient to dump a package of taco seasoning in the ground turkey, I assure you that it takes no more than a minute to add the individual seasonings, which give you a lot more control over the sodium levels and flavor. In fact, this entire recipe takes just 20 minutes to make. While the sweet potatoes are cooking in the microwave, the turkey mixture cooks on the stovetop. Multi-tasking at its best! Once the potatoes are cool enough to handle, cut them in half lengthwise, scoop out the flesh and mash it with some olive oil and cumin before scooping back into the skins. Top it all off with the cooked, seasoned ground turkey mixture. We used pepper Jack on top of our stuffed sweet potatoes, but cheddar, Monterey Jack or even Parmesan cheese would work just as well. Preheat the broiler. Spoon the turkey mixture into each sweet potato skin. Top each with 1 tablespoon grated cheese. Broil until the cheese is melted, about 30 seconds. Garnish with parsley. Serve. This is great for Taco Tuesday! Great way to eat a sweet potato! I don’t usually like sweet potatoes, but I could get behind these! These look incredible. I’m a huge fan of sweet potatoes but have never stuffed them. Great idea! These look outrageously YUMMY! What a great idea! Sweet patatoes and turkey sound so good! I won’t mind to have this turkey taco stuffed weet patatoes for dinner tonight! I made this recipe this week. The flavor of the turkey taco stuffed sweet potatoes was good. I could cook for my family a delicious dinner. I will be sure to come back here.his is a really good post. Thank you! We can definitly use a fun new way to serve taco’s since we eat them several nights a week! This is just right! Are these cooked in the oven and the microwave? The directions say to place on a baking sheet? If so at what temp? And for how long? Hi Elizabeth, the potatoes are cooked in the microwave, then the stuffed potatoes are cooked under the broiler for 30 seconds to melt the cheese (see step 4 of the directions), which is why they’re placed on a the baking sheet. I hope you enjoy them! I’m confused. It makes it seem like we are supposed to cook the potatoes in the oven before we broil them. It says as the potatoes are cooking to brown the meat. So how long do they go in the oven and for what temp? Hi Nicole, I just edited the recipe to make it a bit clearer. The potatoes are fully cooked in the microwave, then the stuffed potatoes are cooked under the broiler for 30 seconds just to melt the cheese. I hope you enjoy them! These are wonderful, the combination of the Turkey and sweet potatoes are delightful. This is a keeper for sure! Are these yams? At my grocery store the sweet potatoes are white and yams are orange. So I’m never sure which one to get. That’s always confusing, Lori! Technically they’re yams, but some grocery store label them as sweet potatoes. Yams are native to Africa. What most North American s think is a yam is actually a soft sweet potato. Maybe we need to educate our grocers. This was delicious! I left out the cheese and used one fresh tomato instead of a can and it still worked great! It definitely takes more than 10 minutes to cook/prep though. We made this last night and will be making it a thousand more times. It was that good and the entire family agreed. Thank you for the recipe. We don’t own a microwave. This might be a silly question, but how long would the sweet potatoes need to be in the oven (and at what temperature) to achieve the same results as the ones produced with a microwave? I have all the ingredients and can’t wait to try this out! Thank you in advance! Hi Katy, not a silly question at all. To bake a sweet potato, pierce the potato in several places with the tines of a fork, then bake in a 400 degree oven for about 45 minutes, or until tender. I hope you enjoy the recipe! When you pop them in the oven at the end, it’s just to melt the cheese. The sweet potatoes are cooked in the microwave at the beginning of the recipe. 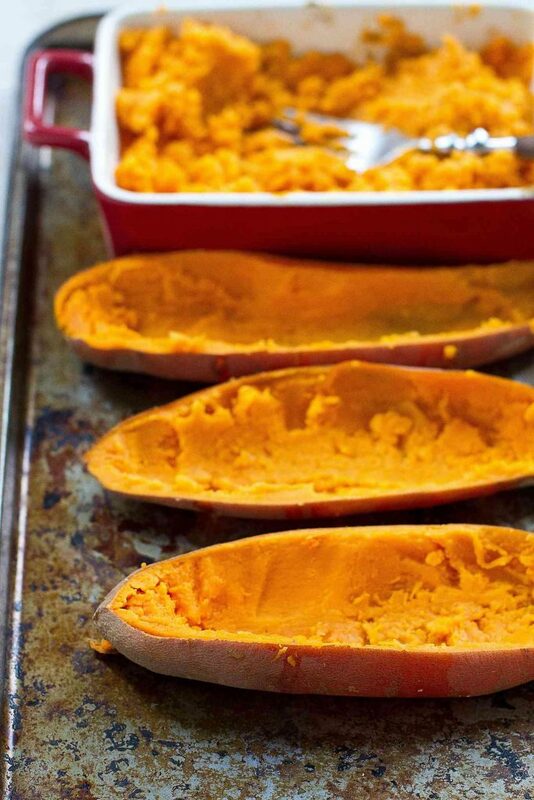 However, if you choose to bake the sweet potatoes in the oven instead of the microwave (before adding the filling), you can place them directly on a baking sheet without wrapping in foil. I made these last night. My husband and I both loved them! Delicious and easy – thank you for the recipe! Made these tonight and they were great! I love that this is a healthier taco option, yet still filling. I added black beans, chopped onion and poblano pepper to the turkey mixture and used cilantro instead of parsley. Will definitely make again. Another plus is this is a very budget friendly meal. Yummm! Made these bad boys for dinner last night with a few alterations. I added black beans & green chills to my turkey mixture. Also added a little bit of the shredded pepper jack to my sweet potato mixture before returning to the skins. Everyone loved them & went to bed with happy tummys. Thank you for the inspiration ! These never get old. We’ve made them 5 or 6 times now and enjoy them even more each time . It’s just my husband and me, so the remaining two stuffed potatoes get eaten for lunch the next day. Two meals in one! Just wondering how they hold up as left overs? Hi Emily, I made a slight adjustment to the nutritional information because I was having some hiccups with a new recipe card I switched to for my site. However, the Smart Points remain at 6 because some of the vegetables are counted as 0 points. I calculate the recipe nutritional info without the 0 point vegetables and use this information to calculate the Smart Points. However, the nutritional info listed in my recipe includes all ingredients. Does that make sense? Loved them. You’ve converted a sweet potato hater ! I hope you don’t mind that I posted my version of this – with a link to your recipe! Really enjoyed the recipe. Just wondering after you add the tomatoes , do you cook them for awhile? Thx, love trying new healthy recipes! What would you recommend making as a side dish to these potato’s? Hi Kayleigh, a spinach, kale or mixed green salad would be a great option! I just made this for the first time. It was delicious. I will be making this again. Thank you for this amazing recipe. I’m excited to try these, but I need some clarification on wow points. Is the 5 sp for one half of the potatoe or whole? Hi Kara, it’s 5 SP for each stuffed half, which is a pretty generous serving. It will fill you up, I promise! We made these for dinner and loved them.. we added black beans and instead of mashing the potatoes, I diced the cooked potatoes and mixed them in with the ground turkey mixture. My daughter loved the leftovers in lettuce wraps! This was very flavorful. I baked the potatoes in the oven. Be sure to use big potatoes because smaller ones won’t hold their shape when you scoop out the insides. All the different flavors tested good together. I had lots of left over turkey mixture which I loved. What side goes well with this meal? Im a novice cook and looking to feed my husband and two small children:) ps these look amazing, cant wait to make them tomorrow night! Hi Mary, I apologize for not responding to this earlier. I usually serve a big salad (green, spinach or kale) with this recipe. You may find some in my salads category that appeal. This is by far my very favorite sweet potato recipe! Even my husband who does NOT like sweet potatoes gobbles this up! Fantastic combination of flavors! Thanks for another great recipe Dara!